I started off disappointed with this anthology. One story didn't even have a supernatural element or proper sleuthing involved, a criminal looking to blackmail another individual. The book seemed half of stories that were excellent and the other half forgettable or unforgivable. The last story annoyed me so much, I didn't even finish reading it. But that's the wonder of an anthology. "The Gateway of the Monster" by William Hope Hodgson - This story was actually spooky. You know the narrator, ,Carnacki lives through his ordeal in a haunted room, but how he spends this time there curls the toes. 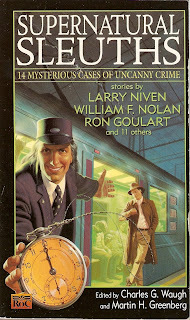 "The Midnight El" by Robert Weinberg - Truly a detective story and the one I believe the cover is based upon. A detective enters the Midnight El which picks up the dead who died that day throughout the city of Chicago, however, it has an extra passenger who Detective Taine intends to bring back. "The Cardula Detective Agency" by Jack Ritchie - A certain Count is down and out on his luck and funds. He's hired to protect a gentleman for one night who has become a target by "relatives" due to an announcement of his intent to change his will. This was a little humorous and it's nice to see what the Count's been up to these days. "Children of Ubasti" by Seabury Quinn - Jules de Grandin and Dr. Trowbridge attend a party and meet two interesting guests with exhibit feline qualities. Later that night, they meet a girl with a story so horrific, it has to be true regarding two people who also exhibit feline qualities. It doesn't take de Grandin long to figure out the two sets of people are one and the same and how to defeat them. i can't believe that Martin Greenberg would put his name on anything second-rate. i blame all the disappointing sections on Mr. Waugh.